The Presidency of Donald J. Trump has unleashed a barrage of potential changes to US economic policymaking and the economy. This column introduces a new VoxEU eBook which examines many of the major economic policy issues and challenges arising under the new US administration. The eBook includes 18 chapters by leading economists across a range of areas in domestic and international economic policy. Many chapters are sharply critical of the Trump administration’s new approach. The election of Donald J. Trump to the US Presidency on November 8, 2016 was unexpected. Despite being the Republican party’s nominee, Trump campaigned as a political outsider on a platform of eclectic policy ideas. And without prior governing experience, there is little historical record from which to predict his administration’s economic policymaking priorities. Yet, Republican Congressional majorities in the House of Representatives and Senate imply a political opportunity for Trump to overhaul existing laws and institutions. Furthermore, a US President can take many actions unilaterally – without the need to work with Congress – to also effectuate economic policy change. Indeed, the resulting US court challenges to some of Trump’s Executive Orders signal his administration’s willingness to test historical limits on Presidential authority. This collection of essays by leading economists highlights many of the most pressing domestic and international economic policy issues on the Trump docket. To date, the Trump administration is not formulating its economic policies based on economic evidence, research, or much input from professional economists. In several areas, the Trump administration is threatening the underlying institutions that implement successful policy, putting the systems themselves at risk. Many of the Trump administration’s proposed policies are expected to result in economic outcomes that run into direct conflict with the Administration’s stated policy goals. A first set of essays examines Trump’s approach to the US domestic economy and key areas of policy affecting health, individuals and families, education, labour markets, and the environment. Health care and health insurance were a first political priority for President Trump and the Republican leaders in the House of Representatives. The result has been efforts to repeal, or repeal and replace, the 2010 Affordable Care Act (ACA), otherwise known as ‘Obamacare.’ Second, Trump’s draft 2018 budget also called for major cuts to the US social safety net, with the potential to adversely impact lifetime outcomes for at-risk youth, rising US income inequality, and the fabled ‘American Dream.’ On education, a third issue is Trump’s potential to roll back the 2014 gainful employment (GE) regulations on the increasingly important and controversial “for profit” college sector. Fourth is the unintended consequences – running counter to the administration’s own trade policy goals – of Trump’s proposed changes to the US Corporate Average Fuel Economy (CAFE) environmental regulations. The 2016 Presidential campaign also brought into sharp political relief other misunderstood areas of the US economy, including the labor market. One was manufacturing job loss, and the need for evidence to reject the political argument that it was mainly increased international trade – especially imports from China and Mexico – to blame for the negative outcomes affecting a segment of US workers. A second is the role of immigration in the United States. Trump’s first 100 days featured a slew of Executive Orders banning travellers and immigrants from certain majority-Muslim countries, enhanced deportations and construction of a border wall with Mexico, and limiting access to H1-B visas for highly-skilled foreign workers. A second set of essays examines Trump’s potential impact on the domestic economy through tax reform and changes to monetary policymaking, financial regulatory reform, and US macroeconomic performance. Like health care, US tax reform has been another early item on the Trump administration’s agenda; the last major overhaul of the US tax code took place in 1986. Trump has proposed mainly tax cuts, whereas the House Republican leadership has put forward a major reform to the US business tax system: replacement of the current corporate income tax with a destination-based, cash flow tax that would include a highly controversial (and little understand) border tax adjustment. Trump’s approach to three important areas of macroeconomic policy also stand out. The first concerns threats to the political independence to the Federal Reserve, the United States’ central bank. Second is the intent of the Trump administration to pursue financial deregulation, and the potential for significant reform to the 2010 Dodd-Frank Act. Third is the Administration’s general approach to the macroeconomy, and suggestions that the United States is likely to achieve sustained long-run annual growth of as high as 6 percent. The third set of essays examines President Trump’s potentially radical reshaping of US trade policy. One particularly striking line from his Inaugural Address – “Protection will lead to great prosperity and strength” – indicates that an influential wing of his administration finds trade barriers appealing and perceives them as likely to benefit the U.S. economy. The Trump administration has used its first 100 days in office to signal many potential changes to US trade policy and its willingness to abide by trade agreements. Table 1 presents a list. Nevertheless, the only definitive policy change taken was in the first week, when the administration withdrew from the Trans-Pacific Partnership (TPP). Perhaps the other items are only the tough talk of a negotiator and may not result in policies that damage the US economy. Many of the Executive Orders, for example, are intentions to study the source of a “problem” the Administration perceives face the US economy. Yet other items in Table 1 do have worrisome implications, and the chapters in this volume takes up many of those concerns. What does Trump’s TPP withdrawal mean for the US strategy to engage China with its market-oriented reforms and integration in the global system? What are the potential implications of a Trump administration renegotiation of NAFTA? 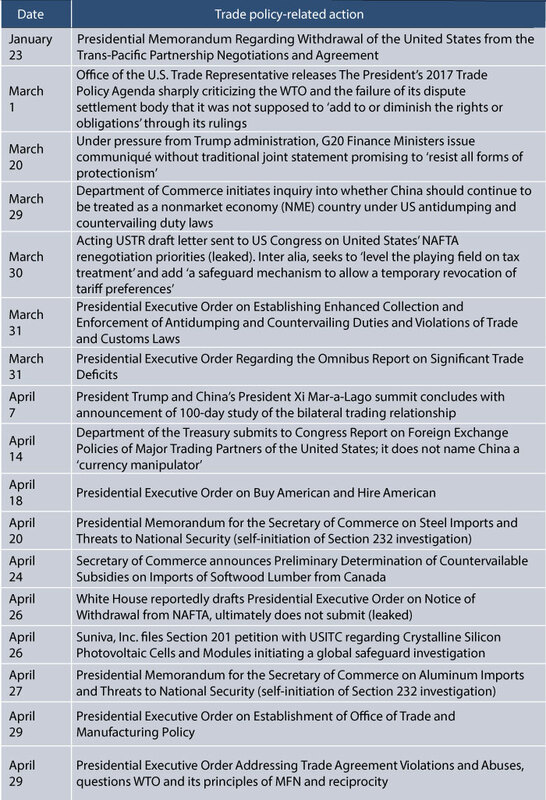 Is this ‘100 day’ list – especially of trade enforcement cases on products like steel and lumber – just the tip of the iceberg on more sweeping change to US policy? , Why has the United States championed certain WTO principles in trade negotiations, including nondiscriminatory treatment, through the ‘most-favoured-nation’ (MFN) rule, and ‘reciprocity’, and what are the implications of giving that up? Finally, what is the future of US-Europe trade relations, i.e., a key linchpin behind the global trading system for the last 70 years? The flurry of activity during the Trump administration’s first ‘100 days’ in office confirms a nontraditional approach to governing, a still largely unknown short- and long-term strategy, and unclear economic policy priorities. Some of the policies being subjected to potential reform – including health care, taxes, and financial sector regulation – may have been likely to arise, independent of the individual sitting in the Oval Office. But others – such as central bank independence, more radical steps on immigration, and reversing the US’s decades-long approach to trade policy and commitment to international cooperation – are much more extreme, far-reaching, and potentially disruptive. On Trump’s economic policies, the broad consensus across this volume’s authors is one of watchful wariness and considerable concern. Many of the Trump administration’s proposed economic policy changes have the potential for significant short- and long-run disruption to the US and global economy. Shawn Donnan and Demetri Sevastopulo, “White House civil war breaks out over trade,” Financial Times, 10 March 2017. Yet a concern with the Executive Orders is that because the issue frequently selected for study – e.g., bilateral trade deficits, trade agreement violations – may itself be a non-problem; any efforts to identify its cause in order to solve it may result in more harm than good. Chad P. Bown, “Trump says China is not a market economy. That's a big deal.," The Washington Post, 12 December 2016. Chad P. Bown, “What is NAFTA, and what would happen to U.S. trade without it?" The Washington Post, 15 February 2017. Chad P. Bown, “Trump's threat of steel tariffs heralds big changes in trade policy," The Washington Post, 21 April 2017. Chad P. Bown, “Did Trump just take an ax to the U.S. trade policy relationship with Canada?" The Washington Post, 27 April 2017. Chad P. Bown, “Is the WTO one of Trump's 'big quagmire deals'? Here's what's at stake." The Washington Post, 28 February 2017.